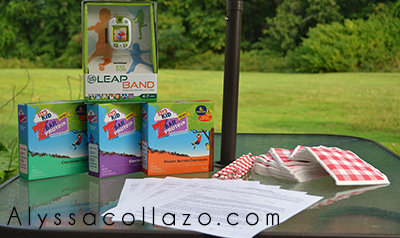 Keep your kids active, healthy and happy with LeapBand and CLIF Kid! Thanks to MomSelect I was able to host a Fit Made Fun MommyParty! My wonderful Kit included - Two (2) LeapBands, CLIF Kid Zbar Protein samples for my guests, and Information on Fit Made Fun Day. I'm sure your wondering what is LeapBand? LeapBand is the cool wearable activity tracker that encourages kids to get active with customizable virtual pet pals. LeapBand tracks kids' every movement and suggests fun active challenges - and the more they move, the more points they earn to unlock virtual rewards for their pets and get to new levels! Includes rechargeable battery, water-resistant design and hi-res screen; manage play times with School/Quiet modes. Clif Kid Zbar Protein is a delicious whole grain protein snack made with nutritious building blocks for kids' growing bodies…so kids can keep zipping and zooming along. 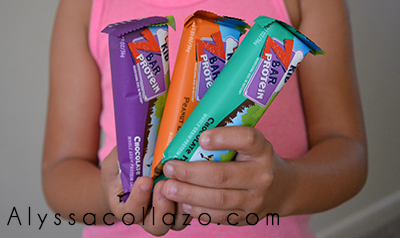 These Protein bars come in 3 delicious flavors. Chocolate Chip, Peanut Butter Chocolate and Chocolate Mint. They also have 5g of Protein and 3g Fiber! And now onto our Fit Made Fun MommyParty! We had a blast learning about their LeapBand's, it was a day filled with fun activities and yummy snacks! We played Hopscotch, Freeze Tag, Frogs on the Lily Pads and SO much more. Unfortunately due to the humidity we kept our Fit Made Fun party short, but that didn't stop our guests from playing inside! I really love that the LeapBand promotes Healthy habits. In Pet Chef, they can help their pet collect food to make healthy snacks and unlock nutrition fun facts. Everything about the LeapBand is pretty amazing and I highly recommend it! Another GREAT product by LeapFrog! The fit band for kids look like a fun add on to a kids plan to get acid. What a cool party! 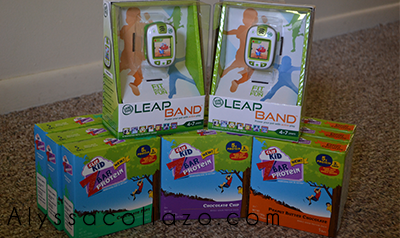 My kids love their Cliff Bars, I bet they would adore the Leap Band as well. It will probably be on their Christmas list. I keep hearing about the leapband lately and it looks like so much fun. We're a family who's always outside, so I bet the kids would love it. I love the Leap Frog brand. They always come out with amazing things! This product looks so fun. I will have to check it out for my girls. Cliff bars are in the closet.. they are so good and produce energy when needed.. I think my kids are too old for the Leap products but it is so cool that they have this for kids. My 6 year old loves wearing as step counter. He would love this one much better. That's a nice thing that they've got, it helps kids get active. Sounds like my kind of party. Healthy, family and fun. My kids would love those Leapbands. I love hearing about things that keep kids active. Totally down my alley. :) Thank you for sharing the product. How cute, a hopscotch party with the kids! Love it. Great mommying! I like this. Sounds like a exercise tuned Tamagotchi! I want those LeapBand, not for me but for my kids, I see your kids are having fun. 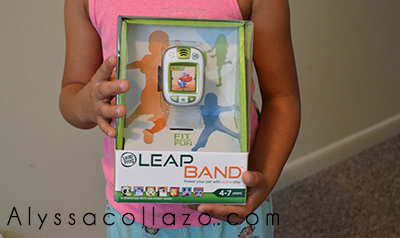 I love the idea of the Leap Bands and think they are a fantastic idea for kids. I have never heard of them! Thanks for sharing the product with your readers. Love it. I saw these the other day and considered buying one. Leap Frog is such a wonderful brand. I hosted a mommy party last year and had so much fun! I definitely need to look into this! My stepdaughter gained 20 lbs over the summer and she is wanting to be more active. I love my Vivofit. I think one for kids is a great idea. Kids should have activity trackers since it would encourage them to move and play. It also reduces idle and sitting time. It is a cute idea! I wear a tracker and I am sure my kids would get a kick out of wearing their own. Those both look like really great products. We've heard of leapfrog before but not this particular product. Will have to check it out. My kids love Clif bars! But I've never heard of an activity tracker for kids. I wonder if my 8 year old would think she's too old for a LeapBand. The games sound like they were so much fun. Sorry the humidity was a bit of a bother, but kids have fun anyhow! Those snack bars look delicious! I would definitely love to try that LeapBand! Thanks for sharing! Anything to get kids to be active is so exciting to me! :) I love the Leap Bands! I can totally relate to the humidity, maybe inside active time lol! I never knew they had cliff kid zbars! This is a great way for children to get a jumpstart on fitness! Wow, these products look like a fun way to keep your family healthy! I love those bars too!! Yay those seems great for the whole family!